At Follow My Vote, we encourage non-partisanship and healthy debate on every issue, in order to more accurately gauge where the majority of the population stands on each issue. However, we recognize the current two-party system, and have provided a brief overview of the party system as it stands today. The political parties are groups of people working to gain and exercise power within the government by supporting their members and fighting for their constituents’ needs together. They recruit candidates, raise funds, and drum up support throughout the election process and work together throughout the day-to-day of politics. 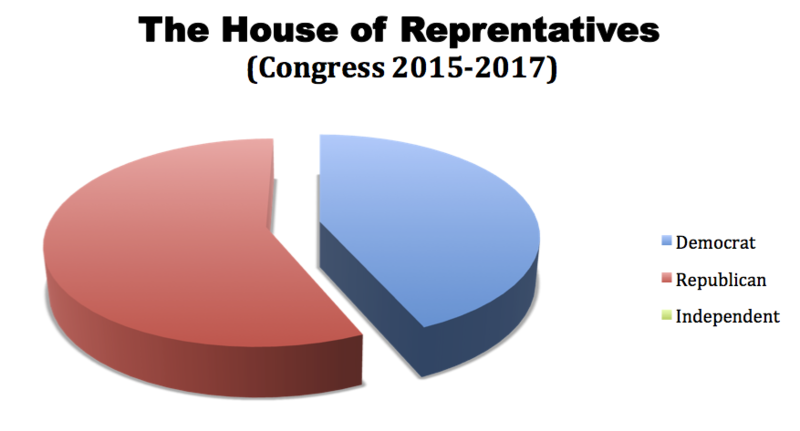 Political Parties are an intrinsic part of the current American political system. In 2012, 63% of all voters were currently registered with either the Democrat or Republican party, with another 33% declaring themselves independent voters. 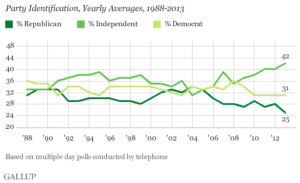 According to a 2013 Gallup poll illustrated below, the number of people who identify as Independent is rising. 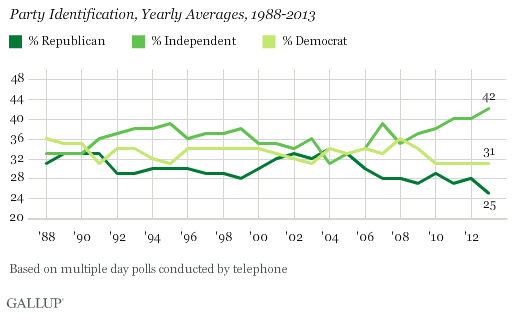 An illustration of party affiliation over the years. The founding fathers opposed a party system, believing that factions in the political system would lead to the manipulation of the people. However, since the early 19th century, parties have played a large role in the education of the people, as well as propelling the political process forward, for better or worse. Change does happen, though. The original United States parties, formed in 1792, were the Federalists and the Democratic-Republicans. As the Federalists, who supported a national bank and strict economic policies between the states, lost favor with the public, they disappeared. In 1828, Democratic-Republicans split into the Jacksonian Democrats, who believed in greater democracy for the common man, and the Whigs, who supported Congressional supremacy over the President. Political party growth and change reflects the needs and values of the people they represent. The two party system contributes to a partisan atmosphere in politics. 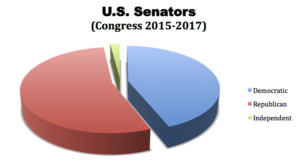 The Democrats represent the ‘left’ or ‘liberal’ and their opposites are the Republicans, who represent the ‘right’ or ‘conservative’. Third parties are the exception. A ‘third party’ is any party other than Republican or Democrat, such as the Green Party or Libertarian Party. These parties are disadvantaged in the current voting system in many ways, including ballot access laws and the winner-takes-all vote counting. Despite the fact they rarely make the ballots in many states, they play an important role. Third-party candidates running for public office do so to call attention to otherwise ignored or misrepresented issues, peoples, or values.